DeckRevive is a one-of-a-kind polymer coating that resurfaces and restores aging wood decks, walkways, steps and more, allowing you to enjoy your existing structure for years! Just add exterior latex paint of any color and roll on with everyday paint tools. Deck Revive is a DIY acrylic based polymer deck coating that resurfaces old decks, docks and other treated lumber — in ANY color you choose. Deck Revive repairs and protects wood structures from the constant expansion and contraction cycle that destroys wood. Traditional deck stains, deck paints and deck sealers just put new color on old splinters, cracks and nailheads and have to be re-applied annually. Deck Revive actually fills in cracks and knots, locks down splinters and nailheads, and provides a new slip-resistant textured surface that lasts for years. Our Deck Revive coating will give you a new durable, scuff, stain and fire-resistant surface that requires zero to little maintenance. So easy to apply with everyday paintbrushes and rollers and tools clean up with water. Dries quickly for minimal time-out-of-service. Can be applied in the morning and enjoyed that evening. 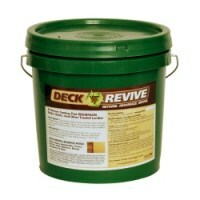 Your Deck Revive kit contains a liquid component and a dry component. To these, you add one gallon of ANY color of gloss exterior acrylic latex paint. Color choice is unlimited – you can have any color your paint store can mix up! 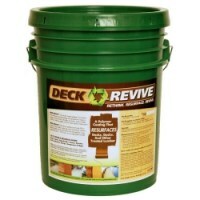 Deck Revive is the environmentally friendly choice. It is water-based, VOC-free and non-toxic. When you refurbish existing wood structures with Deck Revive, you prolong their service life and keep them out of landfills. Save thousands over the cost of replacement or annual deck stain and deck seal maintenance when you choose Deck Revive. You’ll also save time — so you can spend more of it enjoying your outdoor living spaces, not maintaining them! So take your shoes off and start enjoying your old deck with our revolutionary resurfacing coating. Your family, friends, and kids can run around splinter free for years to come.